The total market size for organic packaged food and beverages in Italy in 2017 is US$1,756.6mn, making it the 5th largest market in the world by value. Per capita spending on organic packaged food and beverages in Italy is US$28.99, which ranks as the 14th largest spending per capita in the world. The largest company by sales in organic packaged food and beverages is Granlatte, which maintains 12% of total sales; it is followed by Rigoni di Asiago SpA and Idea Team Srl. Organic packaged food and beverages in Italy will see strong year-on-year growth of 10% in 2018. This is much faster than the rest of the Western European region, which will experience 5%-6% year-on-year growth in 2018. Italy maintains a market size for organic packaged food and beverages of US$1,756.6mn in 2017, which is 4.4% of global category sales. Within the Western Europe region, only Germany and France surpass Italy in total value sales of organic packaged food and beverages. 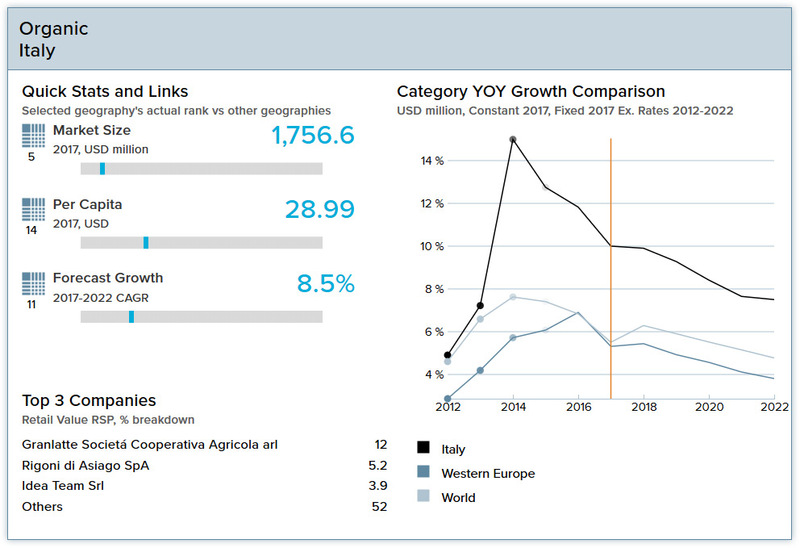 Italy will experience moderate forecast growth of sales of organic packaged food and beverages, at an 8.5% CAGR from 2017–2022. Italy is seeing an organic food boom in terms of both production and sales. Italian companies dominate the landscape, but some foreign companies have carved out small market shares. Organic packaged food sales have grown at strong rates in recent years, and as of 2016 11% of Italy’s agricultural areas was devoted to organic production (almost double the EU average of 6%). Organic beverages sales have increased, as well, but at much slower rates than organic packaged food, mainly due to the fact that Italian consumers value Italian provenance and are generally willing to pay more for organic food products grown and produced in Italy and less willing to pay premium prices for organic coffee and tea, which are not domestically produced. The overall health and wellness trend and consumers’ growing concerns about chemicals and hormones used in food production are driving demand for organic products. Dairy accounts for the largest portion of organic packaged food sales, and tea ranks first for organic beverages sales. The organic food and beverages landscape in Italy is fragmented and competitive. Domestic players dominate, but some foreign companies have managed to carve out small value shares. Italian company Granlatte Societá Cooperativa Agricola is the market leader with a 12.0% value share, followed by Rigoni di Asiago SpA at 5.2% value share. Organic packaged food sales are projected to post strong growth in coming years as Italian consumers increasingly demand for natural food products. Organic beverages sales growth will still be slower than that of organic packaged food, but it will accelerate as consumers increasingly opt for quality over quantity when purchasing coffee, tea, chocolate-based powdered drinks and fruit/vegetable juice. Among organic packaged food categories, rice, pasta and noodles is projected to record the highest value sales growth rate through 2022, and coffee is expected to be the fastest-growing organic beverage category. The sales value of health and wellness products in Italy has grown slowly but steadily in recent years, dampened by consumers’ declining disposable incomes following the economic crisis. Given Italians’ growing health consciousness, many consumers are experimenting with diets that are free from wheat, gluten, dairy, lactose or meat, which is contributing to strong sales of free-from products in the market. Italy is slowly emerging from a along and deep recession. 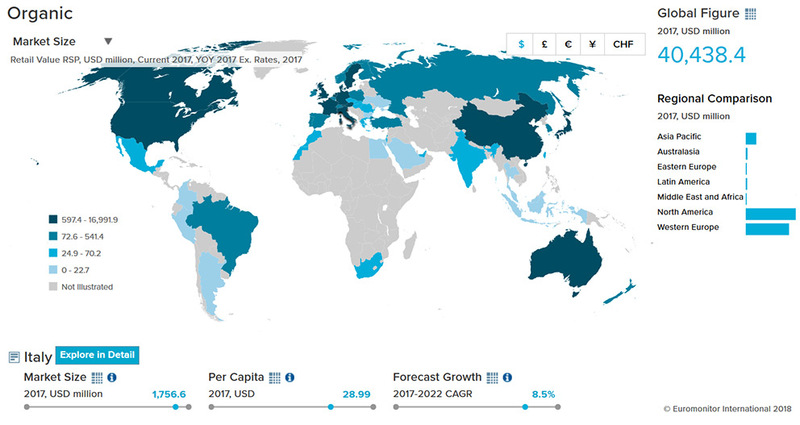 Real GDP grew by 1.5% in 2017 and is projected to grow by 1.2% in 2018, driven by a rise in fixed investment and export growth. In 2017 inflation was 1.3%, and the same rate is expected in 2018. In 2017 Italy’s population totaled 60.6 million, which represented an increase of 3.7 million over the figure for 2000. Italy’s population is rapidly aging, with the median age in 2017 at 45.9 years—5.8 years older than the figure in 2000 and significantly higher than the regional average. The fertility rate is 1.4 births per female, which is below the replacement level. This rate is projected to edge up to 1.5 births per female by 2030. Recent population gains are due almost entirely to immigration. In 2017 per capita consumer expenditure totaled EUR17,147 (US$18,967) and is projected to increase by 1.2% in real terms in 2018. Per capita disposable income in 2017 was EUR18,289 (US$20,230) and will increase by 0.8% in 2018.